Tent outside Prime Minister's residence receives eviction notice from Jerusalem municipality; bereaved families in shock. Bereaved families are in shock at the Jerusalem Municipality, which has given them an evacuation order for setting up a demonstration tent outside the Prime Minister's residence. The tent was set up last week, as a gathering site for bereaved families and disgruntled citizens to express their discontent at the upcoming terrorist release. Dozens of families have protested the move, which will be set in motion late Monday and early Tuesday, to release 26 more convicted terrorists and murderers as part of the negotiations between Israel and the Palestinian Authority (PA). "The Shalit family sat here for months," one bereaved family member stated. "Bereaved families have only been here for 4 days, and after 3 hours this morning we've already received an eviction notice." The bereaved families noted to the press that their intention was never to camp out at the site for months on end in protest of the release. Rather, they had been planning to stay until the release was fully carried out - until Tuesday. The full list of the terrorists being released was revealed Saturday night. All of the terrorists were convicted before the Oslo Accords, and have been in prison for between 19-28 years, according to the Prime Minister's office. 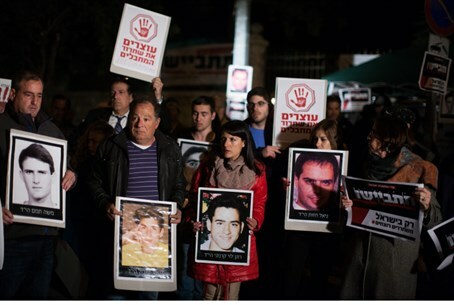 The previous terrorist release, in October, saw waves of protests across Israel. The demonstrations culminated in an emotional protest outside of the hotel room of US Secretary of State John Kerry and a petition submitted to the High Court to stop the releases. The Supreme Court also rejected a second petition against the release Thursday, stating "with all due understanding of the petitioners' pain, their petition does not raise any legal ground for intervention. The claims have been raised and ruled on in the past."